Pigpen is a family card game for 2-4 players that plays in ~ 15 minutes. Players are trying to create pens that will hold pigs, which will score VPs. Think of the pens as a "block" of 6 spaces—three across and two deep. The four outside space are walls. The front center is a gate. And the back center is for food. Shuffle the Pig Cards and create a Pig Deck—the number of which will depend on the number of players. Shuffle the Farmer Cards, deal out five to each player, and then place the rest as a draw deck. On your turn you'll play up to two cards from your hand, discard one card (if you want) to the discard pile, and then draw back up to five cards. Wall Cards: They're either brick or wood walls. Your pen can consist of both types of material—the only difference in the two is which attack card can destroy that type of material. These have a Defense number—the higher the number the stronger the wall. Gate Cards: This is a card with a gate on it, and can be played in the gate space of your pen. Food Cards: These are played in the food space of your pen. Attack Cards: These are things like saws, jackhammers, and other things, used to destroy other pens. If someone breaks a piece of your completed pen, you have until the end of your turn to fix it or the pig runs off and hangs out around the Pig Deck. If another pig gets loose, the current loose pig goes to the bottom of the PIg Deck. As you build new pens, you can use the outside walls as part of a neighboring pen. When the last pig is taken, the game is over. Everyone gets one last play to try and fix any broken pens—the pigs then run out of unfixed pens. Everyone adds up the VPs on their Pigs, and the winner is the person with the most VPs; ties go to the person with the most pigs. Me: "What was your favorite thing?" Me: "What was your second favorite thing?" He: "That you guys lost..."
And that about sums it up: My family liked this game a lot. It's "cute." Jeremiah—Somewhere along the line my kids figured out how fun it is to gang up Mommy and Daddy, and they didn't bother trying to be sneaky about it. We pretty much knew that if they had cards to destroy our pens, we were in for it. Our 5-year old would even stare us down and start making sawing noises before he played his card, to add to the torment. Firestone—It's a card game, so it's very random, and there is a TON of take that. Somehow in a cutesy pig game it doesn't feel as harsh as in other games. And it's short enough that you won't be demolishing fences for 90 minutes, which would make me flip my wig. If I wore a wig. Jeremiah—Yeah the built-in timer is a much needed thanks to the massive amounts of back-and-forth, take-that in the game. It could seriously go on forever. Firestone—Adding to the randomness is the fact that the pigs aren't all worth the same amount. So someone might draw an awesome 4-point pig, place it on a Superfood, and it's pretty much there forever. While I might only draw 1s the whole game. Jeremiah—Yeah, it's a card game which means there's an element of luck of the draw, but there's enough that you can do to level the playing field (or other pens) to keep it competitive. Jeremiah—The game is definitely geared for the family experience. The theme lends itself to that very well, but I could definitely see sitting down with some casual/non-gamer type folks and enjoying some laughs as we deliver blow after blow to each other's pen. Firestone—I'm not going to play this with anyone but my family, but I'm okay having a family-only game. Firestone's Final Verdict—This is a cute game that my family likes playing. There's tons of take-that (almost all of it aimed squarely at me), but it's short and easy to learn. Put this on the table. Jeremiah's Final Verdict—We really loved this game! My boys learned it very quickly, and more importantly so did my wife. It's a great family game that is enjoyable for both adults and kids. I would recommend it for a casual party game, and for church/youth group play. Pigpen is packed with lots of light-hearted "Take that!" Which makes for great player interaction in what is essentially a set-collection game! You should definitely put this game on your table! This game has been fully funded, and they're offering new cards and pigs, so head on over to the Kickstarter campaign and check it out for yourself. There are only 3 days left!! Hey Everyone! Jeremiah checking in with you to give you some cool updates and news! Don't forget those interweb things! Today we're once again joined by our good friend Jason Tagmire. You may know him as the guy who designed Pixel Lincoln and Maximum Throwdown, but today he’s wearing a different hat: developer of a new game by Kevin Kulp, titled PigPen. And look! He’s brought along designer Kevin to talk about PigPen, and the roles that each have had in preparing the game to get it to market. So first of all, tell us about PigPen! JASON: PigPen is a family friendly card game about pig-penning and pen-destruction. Each player is a farmer trying to contain his pigs, but his neighbors will do everything they can to prevent it from happening. He puts up a fence; they pull out a saw. Eventually the pigs come out and score points. Kevin designed and self-published it a few years back and I always thought it deserved a larger audience. With Island Officials, I was able to help it make it to Kickstarter, and hopefully soon enough it will reach that audience. Kevin, how did you land on a barnyard-competition theme for the game? KEVIN: While in college and deciding to make a go of commercial game design, I realized I wanted to make board games. I also realized I would need a diverse offering of game designs. The family game eluded me it seemed, until walking around Philly one day waiting for an IGDA meeting. As my mind sometimes doesn't stop thinking design, I really put my mind in to coming up with a family card game. I had just played "There's a Moose in My House" and it got my mind thinking of its simplicity. So I started with wanting an animal-based game, then thinking of what would be a simple goal for players; once I settled on pigs and pens the game came together rather quickly. It also helped that I grew up around working and non-working farms, and had an aunt who loved pigs. Jason, we know you have a thing for sausage link whips, and meat-based conflict resolution...beyond that, what drew you to this project? JASON: Initially it was the way that it brought Kevin's family together. I saw them all at a convention selling the game and I was there alone showing off a game filled with puking turtles made of pixels. It was the complete opposite and something that I wanted to accomplish personally. My kids were very young at the time, but it stuck in my mind. Once I played the game, it was closer to what I was doing than you would think. Silly sayings, meat references, etc... but behind that a really fun little game. With it consisting of just standard sized cards, it was a great candidate for the tabletop side of Island Officials. Beyond your own titles, what recently released/upcoming games are you excited about this year? KEVIN: Oddville, actually just picked it up. I got to play it at Metatopia and really loved how much game they packed into a small package. There are games that really get my mind going toward design, and this was one of them. I love how the game mechanics work together. I can't wait to play this at my local gaming group. JASON: There have been a few things on Kickstarter lately that I've been excited about. Council of Verona is a wonderful little gem of a game. The Agents looks like my kind of game and I'm really itching to try the print-and-play. Outside of Kickstarter I want AEG's Trains, more Smash Up factions, and Cube Quest from Gamewright. Jason, you’ve been the designer on several titles recently; tell us about the difference between developing vs. designing? Developing a game is really interesting. It's very different from designing in that it's less emotional. You are less tied to the things that you creatively fell in love with, and more willing to make changes that will better the game. With Pigpen it has been a lot of clarifying rules and card types, testing out variations in the numbers on the cards, and seeing what breaks the game or makes it too long, too short, too easy, too hard...etc. These are things that I also do when designing, but it's nice to be limited to those roles for once. I'm able to focus on fine tuning the game without having to be the everyman that I am when designing. KEVIN: When I was college my game design professor pushed us all towards to IGDA meetings as part of our education. It was in going to the meetings that I was introduced to Jason by Ryan Morrison (Island Officials). Jason was one of the only (that I knew of at the time) who was working on board games. I remember having a discussion about what to do to start and Jason went down a list of sites and places to check out. From there we would see each other at IGDA meetings and really got to know each other through another friend and designer, Alex Strang. JASON: I think the first time might have been at Too Many Games about 3-4 years ago. Kevin had his self-published copy of Pigpen for sale and his whole family behind the booth (which was really nice to see at a video game convention). We chatted for a little while and eventually ended up seeing each other around a lot more after that. Is there a Mad Max-related card in the game—perhaps a Master Blaster...? JASON: We probably don't want to give kids nightmares. Or adults. Or me. Kevin, did you approach Jason about coming on board as developer? How has the game changed/improved due to having a developer? KEVIN: I never asked him to publish my games, it was more of showing and telling him my vision for the games. Alex Strang and Jason had started a monthly game night where I was going and we would pull out our game designs. Game designers, myself included, like challenges, and Jason or Alex challenged me to complete one full game in a month. My first month I made two games, one of which might be published by Island Officials next year. In particular, when it came to Pigpen, we played it one-on-one at a game night over at Alex Strang's house. We played, then I explained where I wanted the game to go, my vision and such. From there the conversations started and Jason informed me Island Officials wanted to publish the game and possibly more. When it comes to having him as a developer, the game has only gotten better. He helped streamline the game and put a focus on continuity in gameplay. His experience of having some successful projects under his belt really came through in the final development phase of the game before kickstarting it this week. Guys, tell us what is unique about PigPen when compared to other family style card games. KEVIN: The humor and theme really set the game apart. I know playing it with my children they are always checking out the pigs, picking favorites, and always laughing at what they can do in the game. They love picking on me and doing their best to make sure I don't get the pigs. I saw this in playtests with adults also. Before Jason took up development I had it at Metatopia and this epic game occurred between two couples who had a great time playing the game. There was so much laughter and silliness in that game, that it convinced other players to sign up to play the game, the next day. JASON: It brings out the life of the family. Many family style games are a little stiff, and Pigpen is the complete opposite. When your quiet little sister takes a hammer to your brick wall, sending your pig right into her fort of a pen...you can only laugh about it (and hopefully destroy that fort). Kevin also took the approach that this game should be enjoyable for all ages. The child/adult line is a very hard line to blur and Kevin did a great job with it. Kevin, do you have any plans to expand the game, or will we find out more about that as stretch goals are met within the Kickstarter campaign? KEVIN: There is one expansion already on the Kickstarter with the UFO. I can't say yet, but have another one we'll be adding to the Kickstarter soon. I have more ideas for the game, and depending on how well the game succeeds I'm sure we'll see the ideas coming out over the next couple of months. Jason, how are your many other projects coming along? Anything new you can share with us at this time? JASON: Pixel Lincoln is out! Haha, it's been a long time coming and finally in the hands of the Kickstarter backers and working its way to stores. It's been really awesome chatting with everyone about the game and the feedback I've gotten is very positive. So, I'm working on more Pixel Lincoln stuff. I've been communicating with Game Salute about how to get more cards out there on a regular basis and I should have some news about that soon at the all-new PixelLincoln.com. Also working on a few other projects, but nothing that's far enough along that it would be interesting. I should have some prototypes at GenCon along with the release of Maximum Throwdown there. Can't wait. Kevin, we get to see your lovely family at the end of the Kickstarter video for the game; are they all gamers too? Or is PigPen an attempt to bring them to the table? KEVIN: I will have to admit they are more digital gamers right now; they love Minecraft, Terreria and Roblox. I'm slowly breaking that down and exposing them to board games all the time. And having children is a great excuse to convince the wife those game purchases are for the family and not me. ;) They of course get excited with any game I make and always ask me what my next game is. Lately with Redakai being on sale everywhere I picked up a couple starters and we are playing that; also Jason introduced me to the Mega Man CCG from a decade ago and the kids have shown interest in that one. Also Ticket to Ride and Bang is a big favorite for everyone, including my wife. Who did actually let the dogs out? KEVIN: John Moller's mind-altering pancakes. KEVIN: Thermonuclear powered diamond blade chainsaw. Your reaction to hearing there will be new Star Wars films? KEVIN: Joss Whedon commits fanboy sin. The Green Goblin, or the Hobgoblin? KEVIN: Green, he made the money. KEVIN: What is this IOS thing? Thanks so much for joining us, guys! We've received prototype review copies of the game and will be posting our extensive Double-Take Review of the game soon! 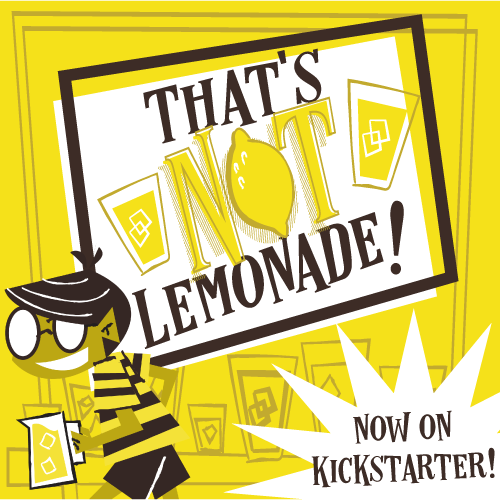 But until then you can check out the Kickstarter campaign for more information. Don't forget to subscribe to TOG over on the right! And look for us on Facebook, Twitter, Instagram, and YouTube!